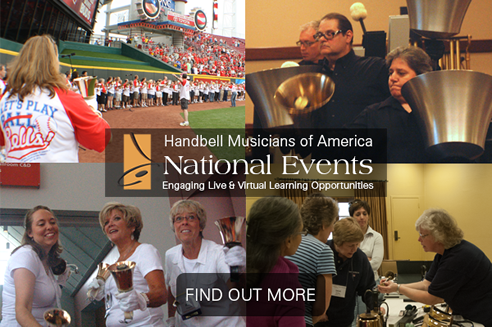 Handbell Musicians of America Members, share your upcoming events HERE. Mass ringing opportunity for choirs in Area 5. Classes, rehearsing with a highly regarded conductor, and presenting a final concert. An opportunity for ringers of all skill levels to ring in a mass setting and attend handbell classes. A group ringing experience for Salisbury and the surrounding area. Come hear The Agape Ringers in concert, visit the event webpage for more information. Massed ringing festival for middle and high school choirs, level 1-2 music. Contact Shane at 256-489-7486. A read and ring event for directors and ringers. Music packets to be selected by Jeffers. Area 9: A fun single-day ringing event (8:45-3:30) with clinician Linda Rutherford. Individuals and groups welcome. Music is the backdrop for advertisements, cartoons, movies and video games. Come hear some of the classics that accompany our lives, including Rhapsody in Blue and the debut performance of the Maria and Draco Opera from Final Fantasy VI. An educational event for adult handbell ringers. An advanced auditioned handbell choir under the direction of a leading handbell director. A musical welcome to spring with light-hearted tunes that appeal to all ages. RIng Sarasota presents "We've Got Rhythm"
Concert starts at 6:00 p.m. Inspired by the toe tappin’ and finger snappin’ tunes of the last 50 years, Ring Sarasota enters into its 7th season with “We’ve Got Rhythm”, a dynamic concert lineup exploring the meaning of rhythm. Handbell ringers in the Inland Northwest will come together ringing 5-7 pieces under the direction of Brian Tervo with techniques classes and a final concert. Contact Greg at 509-758-2622. Director's workshop Friday evening. Classes and massed ringing on Saturday. Lunch included in registration. Handbell festival for Colorado ringers. This event will provide ringers a chance to work on some Festival Conference music, practice skills, and perform in a larger venue. Bronze ensemble, classes and massed ringing with public concert. Observers welcome at this Texas community and college congregation of handbell groups, with a mass concert at the end. One day ringing event with evening concert for the public. A massed ringing event for Area 10 youth. One day handbell festival for Level 1 and 2 choirs. An annual event for 4th - 8th grade ringers which includes a fun service project activity and a closing concert. Concert starts at 8:00 p.m. Inspired by the toe tappin’ and finger snappin’ tunes of the last 50 years, Ring Sarasota enters into its 7th season with “We’ve Got Rhythm”, a dynamic concert lineup exploring the meaning of rhythm. Come and enjoy our spring show! The Raleigh Ringers presents an entertaining two-hour concert consisting of a variety of music enjoyed by all ages. Come hear The Agape Ringers in a joint concert with Purdue University! The Raleigh Ringers presents an entertaining 2-hour performance of a variety of music enjoyed by audiences of all ages. This Easter eve concert (04/15/16 @ 7:30 pm) celebrates Christ's resurrection with "Gethsemane" and "Because He Lives," as well as other exciting works such as "The William Tell Overture" and "Escape Velocity." Handbell ringers will prepare five pieces and take them to a higher level under the direction of Cathy Moklebust. 7:00 pm - A concert featuring "Music of Time and Space," with selections celebrating our place in the universe. Choirs from the area gather for warmups and networking, culminating in an evening concert with massed and solo pieces. An opportunity for ringers to come together to perform pre-rehearsed selections and improve ringing skills. Area 9: A fun single-day ringing event (8:45-3:30) with clinician Jill Fite. Individuals and groups welcome. Concert starts at 4:00 p.m. Inspired by the toe tappin’ and finger snappin’ tunes of the last 50 years, Ring Sarasota enters into its 7th season with “We’ve Got Rhythm”, a dynamic concert lineup exploring the meaning of rhythm. Suncoast Bronze Ringers Present "Made in the USA"
Join us at 4pm for a lighthearted musical adventure. FUMC Bellaires will also ring. Classes, workshops, rehearsals and performances. Dinner and workshop with Spring Ring clinician. Contact Patricia at 802-446-2066. Two-day workshop featuring bronze ensemble,classes, and massed ringing with a public concert. Registrants will rehearse music selections to develop ringing skills and musicianship. A concert will conclude the festival. Workshop, rehearsals, networking and a concert. Contact Patricia at 802-446-2066. One-day event allowing 10-15 choirs to work with composer/conductor Kathleen Wissinger. Contact Jennifer at 724-738-8891. Opportunity for Area 1 handbell musicians to review and rehearse Area 1 Festival Conference repetoire and present a concert to the community. Contact Donna at 401-885-1474. A seminar for handbell directors to refine their skills. Come hear The Agape Ringers in concert! With guest artists, the Brookwood Handbell Ensemble, join the Houston Bronze Ensemble and let the music of handbells carry you back in time, to the beauty of Alaska, to the vastness of outer space, and to points in between. A weekend of ringing and educational opportunities for the ringers and directors of Oregon, Northern California and Washington. Need a few moments to escape to the places of your dreams? Join the Houston Bronze Ensemble and let the music of handbells carry you back in time, to the beauty of Alaska, to the vastness of outer space, and to points in between. Annual spring concert starts at 7 p.m. Annual spring concert starts at 4 p.m.
Massed ringing and classes for the Greater Puget Sound and beyond. Contact Bryant at 206-854-1693. Massed ring and classes for any age ringers from any group. Mostly for beginners through junior high. Massed ringing for elementary school students. Contact Deborah at 775-851-5600. Westminster Concert Bell Choir presents concert with 8 octaves of handbells and 6 octaves of hand chimes. Come celebrate Canada's 150th year by ringing together with internationally acclaimed conductor/composer Michael Glasgow and our very own Terry Head.